VW CEO Matthias Mueller expects driverless cars based on the Sedric concept to arrive at the beginning of the next decade. FRANKFURT -- Germany's auto industry praised its government as the first worldwide to broadly legalize self-driving cars, while cautioning that this was just an initial, but crucial, step in rolling out the technology on roads across the country. Under a new law, expected to go into effect in weeks, any form of automated driving will in principle be allowed as long as a licensed driver is behind the wheel to assume control of the vehicle when necessary. The legislation stops short of legalizing cars operating without a driver or cars that do not have steering wheels and pedals - referred to as Level 5 vehicles. "This paves the foundation for Germany to be the pioneer in autonomous driving," Audi told Automotive News Europe. The industry is now pinning its hopes on Berlin prodding the European Union into enacting similar legislation through the bloc, so autonomous cars don’t have to disable their systems every time they cross the border. "Typically it's the EU that stipulates a directive and member state governments that have to implement it into a respective national law," said a spokeswoman for the VDA, the German auto industry association. In this case, the situation is reversed, she said. Key details still need to be worked out such as how long the handover protocol should be during which a driver must reassume control of the vehicle when prompted. Additional considerations include whether tablets and smartphones can only be used if they are linked to the car, so that in the event of a handover, the vehicle can switch off the device remotely to ensure the driver’s full attention. As a result, Audi's new-generation A8 sedan will not initially come equipped to offer its latest traffic jam pilot system for highways, under which drivers in specific, limited conditions can read a book or stream videos while a computer fully operates the vehicle. Despite parliament passing the legislation in Berlin, "this doesn't mean that starting tomorrow you can take your hands off the wheel," said a spokesman for Continental, which is developing autonomous driving functionality under the term "Cruising Chauffeur" to offer automakers. "The law was simply the basis that permits regulators to finally begin developing the corresponding homologation process." With a number of aspects still unclear, Audi said it is working with type approval authorities on a time plan to roll out its eyes-off Level 3 traffic jam pilot, the first of its kind worldwide. "We are examining currently a variety of scenarios for its staggered introduction in the differing markets, depending on the local homologation and legal requirements," Audi said. "It will not be available from the start of the A8 launch this autumn." Audi is looking into economically feasible ways to retroactively enable the technology for customers who buy the new A8 prior to finding a solution. "Level 3 highly automated driving requires a redundant architecture for the relevant functions, both in terms of hardware and software, starting with the sensors, through a variety of software modules all the way to actuators like the braking system," Audi said. Since accidents remain inevitable, German law requires that a black box record each handover protocol so crash investigators can determine whether a computer or a human was driving at the time of a collision. Automakers also must make it clear to drivers what their autonomous vehicle is capable of and what conditions it cannot cope with to prevent the kind of false expectations that Tesla Model S owners had. Some Tesla drivers believed that Level 2 assistance features, which Tesla calls"Autopilot," were so advanced that they could safely take their eyes off the road. To avoid this, Continental's "Cruising Chauffeur" will advise drivers when a vehicle can pilot itself. Germany’s new legislation will eliminate logical inconsistencies in traffic laws after it goes into effect in the coming weeks - inconsistencies that can even increase roadside risks, according to industry officials. If a driver suddenly suffers a heart attack, for example, a car would be able to slow down, signal and pull to the side of the road on its own. Currently, if a driver does not retake the wheel when instructed, the vehicle is required to disable its assistance systems and continue on its a current trajectory until something brings it to a stop. Continental described such a scenario with a semi-autonomous Level 2 system such as adaptive cruise control system with lane keeping assist. "If a driver takes his hands off the wheel for longer than 10 seconds, then there is one warning tone followed by a second, before the assistance system simply shuts off and the car likely drives into the next tree," the spokesman said. "It’s bizarre and dangerous, but from a legal standpoint, it’s the only correct outcome to solve the dilemma when a vehicle recognizes that a person is not driving." The new German law also includes a specific provision that permits driverless cars in certain cordoned-off areas such as a parking structure in a shopping mall. Robert Bosch believes it can to make use of existing synergies to offer new services via its other diversified businesses, which are all currently in the process of making their products internet-capable. Together with Daimler and Car2Go, Bosch plans to introduce next year its new "automated valet parking" system, where a driver can exit a car at a specified drop-off point in front of a mall or near a pedestrian zone. Sensors allow the car to maneuver itself through the lot to an empty space. All a car needs is electronically controlled steering and braking systems, an automatic transmission, and an internet connection, according to the supplier. 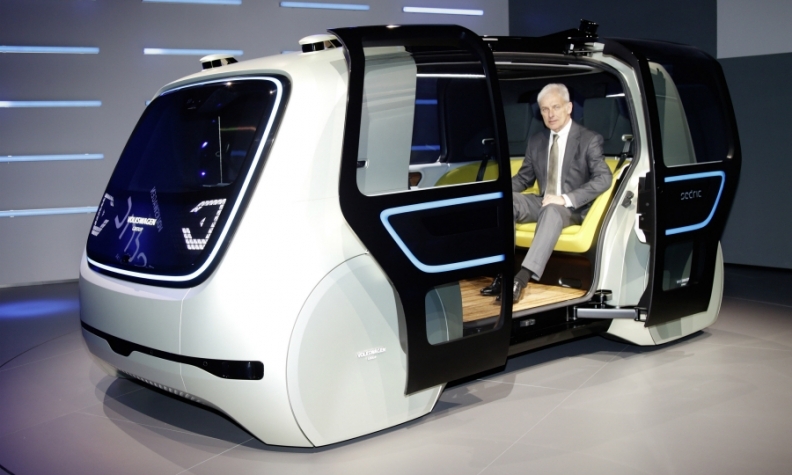 Volkswagen Group CEO Matthias Mueller said at the company's recent annual meeting that he expects the automaker's first Level 5 fully autonomous vehicles modeled on its Sedric concept to be on the roads as early as the beginning of the next decade. The Sedric minivan, which was unveiled at the Geneva auto show in March, has no steering wheel and no pedals. For that to happen Germany, however, Berlin will once more have to update traffic laws that are already among the most modern in the world.